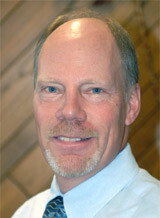 Dr. Johnson is a Bemidji native of over 50 years. He graduated from Bemidji High School in 1974 and completed his pre-chiropractic education at Concordia College in Moorhead, Minnesota and the University of Minnesota in St. Paul. He graduated in 1981 from Northwestern College of Chiropractic in St. Paul, Minnesota. He joined his father Dr. Delmer Johnson and Dr. David Nelson in their practice at its present location. Dr. Johnson and his wife Becky have three daughters. Amanda is a third generation chiropractor. Alissa lives in Waconia, MN with her husband Matthew and Annika who plans to pursue a career in pediatric health care. Dr. Johnson has been a member of the American Chiropractic Association and Minnesota Chiropractic Association since 1981. He served as president of the NW District of the MCA for 3 terms, receiving the Award of Excellence Award from the MCA in 1990. Dr. Johnson has served on multiple boards and committees in the community and for his church. He has volunteered his time coaching youth hockey and fast pitch softball for eight years. He served on the Bemidji Town and Country Club board of directors and is a former president. His hobbies include hunting, fishing, golfing, gardening, reading and woodworking. Helping people with their health problems throughout his career has been incredibly rewarding. My rich family history in chiropractic health care adds greatly to my experience. I thank God daily for allowing me to do what I do for a living. To make an appointment at Chiropractic Professionals, call us at (218) 751-5145.